June is a perfect time for popcorn, root beer and THE FESTIVAL OF WRITING AND ILLUSTRATING. Join us to celebrate writing and illustrating children’s books! The celebrations begins on Friday night with a popcorn and root beer social. (Optional) This is a casual time to meet new members and re-connect with friends. This writing festival is designed for writers and illustrators at every level of experience. It will provide a perfect blend of keynotes, craft-related sessions, critiques, writing time and socializing/connecting with authors, illustrators, editors and an agent. Early-bird Fee: $150 SCBWI members, $180 not yet members. Register by April 25th for this price. *Those staying at the Hilton Double Tree will receive a voucher for a free continental breakfast on Saturday and Sunday. Paid critiques and portfolio reviews by PAL and faculty members will be available for purchase in advance of the Retreat. 200 SE Martin Luther King Jr. Blvd. Our negotiated rate for a double room is $119.00 per night plus 12% IN sales tax. Make sure to the code: SCB to receive this discounted rate! or through the hotel’s website EvansvilleDoubleTreeHotel.com. Individuals will be responsible for room and incidental charges. To view rooms, click HERE. Note, no pets allowed. *Continental breakfast is included with each reservation. at noon on May 18th, 2018. A box lunch is provided on Saturday and is included in your registration fee, so please choose one during registration: Ham Sandwich, Turkey Sandwich, Chicken Salad Sandwich or a Salad. If you are a PAL member (published and listed) attending the conference, you may send up to two of your PAL book titles, publishers and ISBNs to Sharon Vargo at Indiana-IC@scbwi.org by April 25th, 2018 to include in our store. We will do our best to include at least one title per attendee. You may purchase a manuscript critique and will be assigned with one of our faculty/PAL members. You will receive a written critique and a 10 minute, face-to-face meeting to discuss the manuscript at the conference. To ensure a successful critique, see HOW TO MAKE THE MOST OF YOUR CRITIQUE TIME. Please email your manuscript to Dianne Bradley-Kantor at dianebradleywriter@gmail.com no later than April 20th. Click HERE for manuscript critique submission details and deadlines. You may purchase a one-on-one, 10 minute critique session with one of our faculty members. We cannot reschedule a missed appointment. To ensure a successful critique, see HOW TO MAKE THE MOST OF YOUR CRITIQUE TIME. Portfolio critiques are for conference registrants only and are on a first come/first served basis. 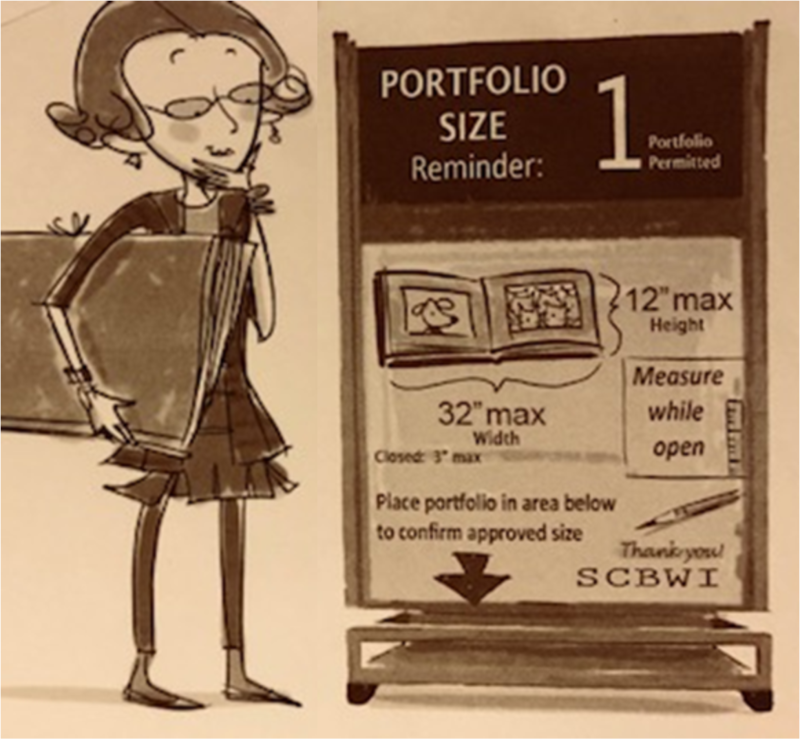 Do NOT send your portfolio in advance; bring it to the conference. There are a limited number of critiques available, so register early. Click HERE for portfolio critique details. The portfolio showcase it a terrific way to get your illustrations in front of the conference faculty and attendees. You may also bring promotional postcards or business cards to share. Please display your portfolio on the tables marked ‘Portfolio Showcase’ on Sat. June 2nd between 3:45 and 4:00. The Portfolio Showcase is from 4 – 6:00 pm on Saturday. This event is free and open to all illustrators attending the conference. Please read through all requirements carefully. What to exhibit: Portfolio, Promo Postcards • Standard formats only • Only one (1) portfolio permitted. • Size: (Measure while open) – Maximum width: 32” max. – Maximum height: 12” max. – Closed Portfolio: 3” tall max. • 10 – 15 images suggested. • Copies or prints only; no original art. • Name: your name and contact information must be in or on your portfolio. This is an art contest open to all illustrators attending the conference. Create a postcard-sized image that will dazzle the faculty judges. One winner will be selected for a one-on-one portfolio review with one of our faculty. Please submit one image per person. It may be a color or black and white image. Image size is 5 x 7 or 7 x 5. Print your image on an 8.5 x 11 page for submission. No original art or framed art can be accepted. Submit your Postcard Palooza entry at the conference registration desk on Sat. June 2nd. Please DO NOT sign or put your name on the image or page. Your submission will be logged in with a number. The winner will be announced at the conference.